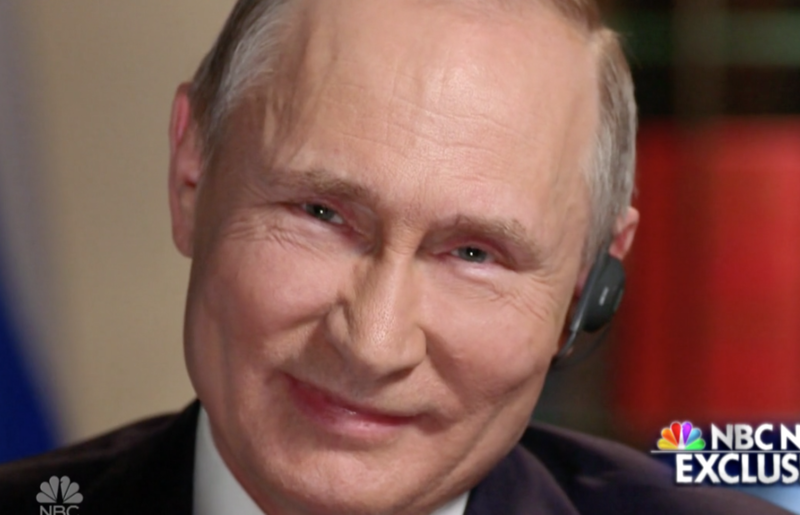 On December 17, Vladimir Putin picked up the phone and called Donald Trump. Ostensibly, the purpose of the call was to thank Trump for intelligence the US provided Russia that helped them thwart a terrorist attack. Here’s what the White House readout described. President Vladimir V. Putin of Russia called President Donald J. Trump today to thank him for the advanced warning the United States intelligence agencies provided to Russia concerning a major terror plot in Saint Petersburg, Russia. Based on the information the United States provided, Russian authorities were able to capture the terrorists just prior to an attack that could have killed large numbers of people. No Russian lives were lost and the terrorist attackers were caught and are now incarcerated. President Trump appreciated the call and told President Putin that he and the entire United States intelligence community were pleased to have helped save so many lives. President Trump stressed the importance of intelligence cooperation to defeat terrorists wherever they may be. Both leaders agreed that this serves as an example of the positive things that can occur when our countries work together. President Putin extended his thanks and congratulations to Central Intelligence Agency (CIA) Director Mike Pompeo and the CIA. President Trump then called Director Pompeo to congratulate him, his very talented people, and the entire intelligence community on a job well done! Putin, of course, has a history of trumping up terrorist attacks for political purposes (which is not to say he’s the only one). That call that Putin initiated serves as important background to an event (or several — the details are still uncertain) that happened earlier this week, as everyone was distracted with Devin Nunes’ theatrics surrounding his memo attacking the Mueller investigation into whether Trump has engaged in a conspiracy with Russia. All three of Russia’s intelligence heads came to DC for a visit. 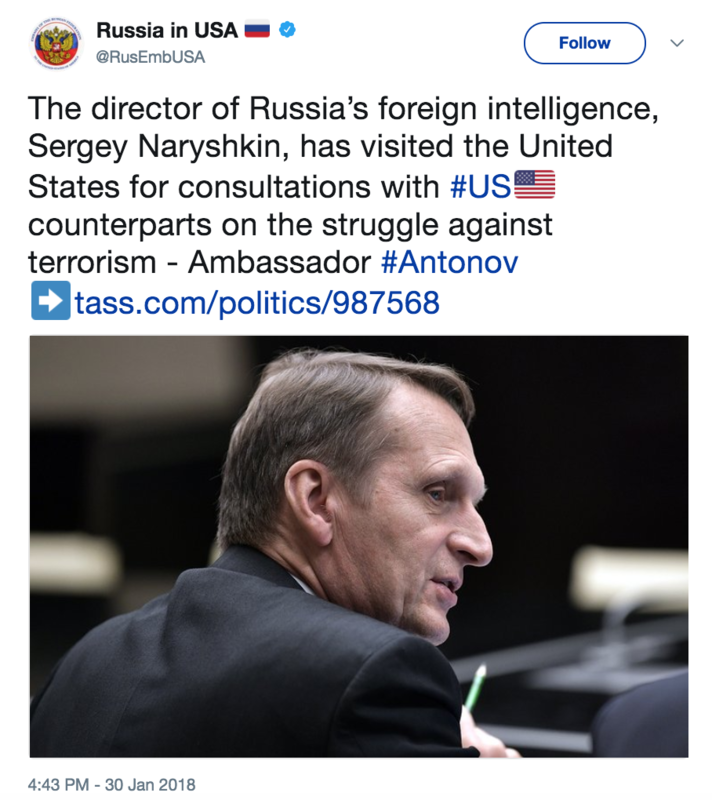 The visit of the sanctioned head of SVR, Sergey Naryshkin — Russia’s foreign intelligence service — was ostentatiously announced by Russia’s embassy. SVR is the agency that tried to recruit Carter Page back in 2013, and which has also newly been given credit for the hack of the DNC in some Dutch reporting (and a recent David Sanger article). It’s clear that SVR wanted Americans to know that their sanctioned head had been through town. As the week went on, WaPo reported that FSB’s Alexander Bortnikov and GRU’s Colonel General Igor Korobov had also been through town (GRU has previously gotten primary credit for the hack and Korobov was also sanctioned in the December 2016 response, and FSB was described as having an assisting role). Pompeo met with Sergey Naryshkin, the head of Russia’s Foreign Intelligence Service or SVR, and Alexander Bortnikov, who runs the FSB, which is the main successor to the Soviet-era security service the KGB. The head of Russia’s military intelligence, the GRU, also came to Washington, though it is not clear he met with Pompeo. A senior U.S. intelligence official based in Moscow was also called back to Washington for the meeting with the CIA chief, said a person familiar with the events, who, like others, spoke on the condition of anonymity to discuss the sensitive meeting. These visits have been associated with Trump’s decision not to enforce congressionally mandated sanctions, claiming that the threat of sanctions is already working even as Mike Pompeo insists that Russia remains a threat. In lieu of providing a mandated list of Russians who could be sanctioned, Treasury basically released the Forbes list of richest Russians, meaning that the sanction list includes people who’re squarely opposed to Putin. In my opinion, reporting on the Forbes list underplays the contempt of the move. Then, today, Treasury released a memo saying Russia was too systematically important to sanction. Indeed, Chuck Schumer emphasized sanctions in a letter he sent to Dan Coats, copied to Mike Pompeo, about the Naryshkin visit (the presence of the others was just becoming public). As you are well aware, Mr. Naryshkin is a Specially Designated National under U.S. sanctions law, which imposes severe financial penalties and prohibits his entry into the U.S. without a waiver. Moreover, the visit of the SVR chief occurred only days before Congress was informed of the president’s decision not to implement sanctions authorized the Countering America’s Adversaries Through Sanctions Act (CAATSA), which was passed with near unanimous, bipartisan support. 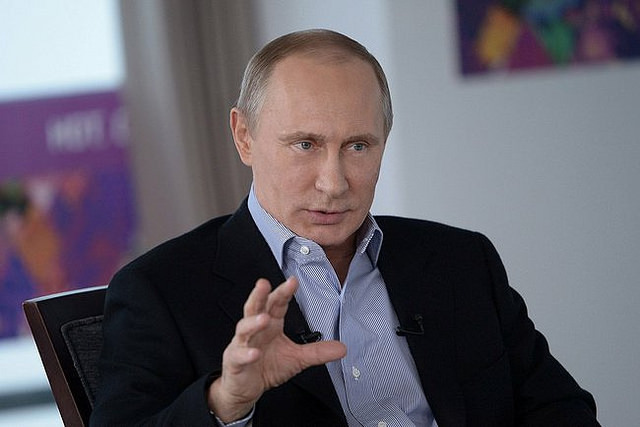 CAATSA was designed to impose a price on Russian President Vladimir Putin and his cronies for well-documented Russian aggression and interference in the 2016 election. However, the administration took little to no action, even as Russia continues its cyberattacks on the U.S. Certainly, that seems a fair conclusion to draw — that by emphasizing Naryshkin’s presence, Russia was also boasting that it was immune from Congress’ attempts to sanction it. But Mike Pompeo, who responded to Schumer, conveniently responded only to Schumer’s public comments, not the letter itself. This allowed Pompeo to dodge a range Schumer’s questions addressing Russia’s attacks on the US. What specific policy issues and topics were discussed by Mr. Naryshkin and U.S. officials? Did the U.S. officials who met with Mr. Naryshkin raise Russia’s interference in the 2016 elections? If not, why was this not raised? If raised, what was his response? Did the U.S. officials who met with Mr. Naryshkin raise existing and congressionally-mandated U.S. sanctions against Russia discussed? If not, why was this not raised? If raised, what was his response? Did the U.S. officials who met with Mr. Naryshkin raise ongoing Russian cyber attacks on the U.S. and its allies, including reported efforts to discredit the Federal Bureau of Investigation and law enforcement investigations into Russian interference in the 2016 U.S. elections? If not, why was this not raised? If raised, what was his response? Did the U.S. officials who met with Mr. Naryshkin make clear that Putin’s interference in the 2018 and 2020 elections would be a hostile act against the United States? If not, why was this not raised? If raised, what was his response? Instead of providing responses to questions about Russian tampering, Pompeo instead excused the whole meeting by pointing to counterterrorism, that same purpose, indeed — the same attack — that Putin raised in his December phone call. We periodically meet with our Russian intelligence counterparts — to keep America safe. While Russia remains an adversary, we would put American lives at greater risk if we ignored opportunities to work with the Russian services in the fight against terrorism. We are proud of that counterterror work, including CIA’s role with its Russian counterparts in the recent disruption of a terrorist plot targeting St. Petersburg, Russia — a plot that could have killed Americans. Security cooperation between our intelligence services has occurred under multiple administrations. I am confident that you would support CIA continuing these engagements that are aimed at protecting the American people. All this together should allay any doubt you might have that this meeting goes beyond counterterrorism, if, indeed, it even has anything to do with counterterrorism. Just as one possible other topic, in November, WSJ reported that DOJ was working towards charging Russians involved in the hack after the new year. The Justice Department has identified more than six members of the Russian government involved in hacking the Democratic National Committee’s computers and swiping sensitive information that became public during the 2016 presidential election, according to people familiar with the investigation. Prosecutors and agents have assembled evidence to charge the Russian officials and could bring a case next year, these people said. Discussions about the case are in the early stages, they said. If filed, the case would provide the clearest picture yet of the actors behind the DNC intrusion. U.S. intelligence agencies have attributed the attack to Russian intelligence services, but haven’t provided detailed information about how they concluded those services were responsible, or any details about the individuals allegedly involved. Today, Russia issued a new warning that America is “hunting” Russians all over the world, citing (among others) hacker Roman Seleznev. “American special services are continuing their de facto hunt for Russians all over the world,” reads the statement published on the ministry’s website on Friday. The Russian diplomats also gave several examples of such arbitrary detentions of Russian citizens that took place in Spain, Latvia, Canada and Greece. “Sometimes these were actual abductions of our compatriots. This is what happened with Konstantin Yaroshenko, who was kidnapped in Liberia in 2010 and secretly taken to the United States in violation of Liberian and international laws. This also happened in 2014 with Roman Seleznyov, who was literally abducted in the Maldives and forcefully taken to American territory,” the statement reads. The ministry also warned that after being handed over to the US justice system, Russian citizens often encounter extremely biased attitudes. And, as I noted earlier, Trey Gowdy — one of the few members of Congress who has seen where Mueller is going with this investigation — cited the import of the counterintelligence case against Russia in a Sunday appearance. 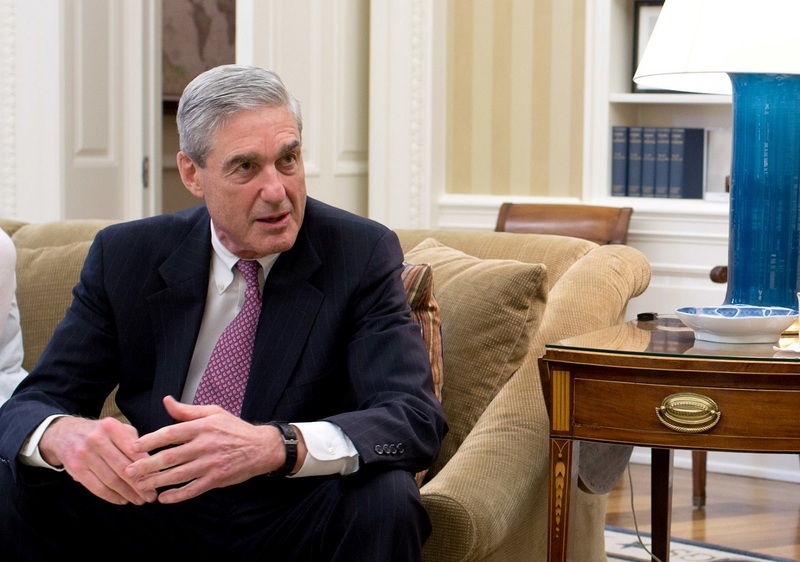 Schumer and other Democrats demanding answers about this visit might think about any ways the Russians might be working to undermine Mueller’s investigation or transparency that might come of it. The “or” refers to the intelligence community’s obligation to inform Congress of any deviation. But without any obligation to spend funds as specifically authorized, there is no obligation to inform Congress if that’s not happening. Since the only real way to prohibit the Executive is to prohibit them to spend money on certain things, the change allows the Trump Administration to do things they’ve been specifically prohibited from doing for the three week period of the continuing resolution. Senators Burr and Warner tried to change the language before passage on January 22, to no avail. This year’s Defense Authorization included a whole slew of limits on Executive Branch activity, including mandating a report if the Executive cooperates with Russia on Syria and prohibiting any military cooperation until such time as Russia leaves Ukraine. It’s possible the Trump Administration would claim those appropriations-tied requirements could be ignored during the time of the continuing resolution. Which just happened to cover the period of the Russian visit. Meanwhile, both before and after the visit, our allies have found ways to raise concerns about sharing intelligence with the US in light of Trump’s coziness with Russia. A key subtext of the stories revealing that Netherlands’ AIVD saw Russian hackers targeting the Democrats via a hacked security camera was that Rick Ledgett’s disclosure of that operation last year had raised concerns about sharing with the US. President elect Donald Trump categorically refuses to explicitly acknowledge the Russian interference. It would tarnish the gleam of his electoral victory. He has also frequently praised Russia, and president Putin in particular. This is one of the reasons the American intelligence services eagerly leak information: to prove that the Russians did in fact interfere with the elections. And that is why intelligence services have told American media about the amazing access of a ‘western ally’. This has led to anger in Zoetermeer and The Hague. Some Dutchmen even feel betrayed. It’s absolutely not done to reveal the methods of a friendly intelligence service, especially if you’re benefiting from their intelligence. But no matter how vehemently the heads of the AIVD and MIVD express their displeasure, they don’t feel understood by the Americans. It’s made the AIVD and MIVD a lot more cautious when it comes to sharing intelligence. They’ve become increasingly suspicious since Trump was elected president. Then, the author of a book on Israeli’s assassinations has suggested that the intelligence Trump shared with the Russians goes beyond what got publicly reported, goes to the heart of Israeli intelligence operations. DAVIES: So if I understand it, you know of specific information that the U.S. shared with the Russians that has not been revealed publicly and that you are not revealing publicly? BERGMAN: The nature of the information that President Trump revealed to Foreign Minister Lavrov is of the most secretive nature. Finally, a piece on the Nunes memo out today suggests the British will be less likely to share intelligence with Trump’s administration after the release of the memo (though this is admittedly based on US congressional claims, not British sources). Britain’s spy agencies risk having their intelligence methods revealed if Donald Trump releases a controversial memo about the FBI, congressional figures have warned. The UK will be less likely to share confidential information if the secret memo about the Russian investigation is made public, according to those opposing its release. Clearly, this meeting goes beyond counterterrorism cooperation. And given the way that both Treasury and CIA have acted contemptuously in the aftermath of the visit, Schumer and others should be far more aggressive in seeking answers about what this visit really entailed. Update: I’ve added the section on Section 504. I’ve got a piece coming out on all the Russian-related provisions in the Intelligence Authorization bill for next year, which are for the most part really laudable policy proposals. But I wanted to look more closely at this one. SEC. 606. REPORT ON CYBER ATTACKS BY FOREIGN GOVERNMENTS AGAINST UNITED STATES ELECTION INFRASTRUCTURE. (a) Report Required.—Not later than 60 days after the date of the enactment of this Act, the Under Secretary of Homeland Security for Intelligence and Analysis shall submit to congressional leadership and the congressional intelligence committees a report on cyber attacks and attempted cyber attacks by foreign governments on United States election infrastructure in States and localities in connection with the 2016 presidential election in the United States and such cyber attacks or attempted cyber attacks as the Under Secretary anticipates against such infrastructure. Such report shall identify the States and localities affected and shall include cyber attacks and attempted cyber attacks against voter registration databases, voting machines, voting-related computer networks, and the networks of secretaries of State and other election officials. (b) Form.—The report submitted under subsection (a) shall be submitted in unclassified form, but may include a classified annex. (A) The majority leader of the Senate. (B) The minority leader of the Senate. (C) The Speaker of the House of Representatives. (D) The minority leader of the House of Representatives. (2) STATE.—The term “State” means any State of the United States, the District of Columbia, the Commonwealth of Puerto Rico, and any territory or possession of the United States. It requires the Department of Homeland Security to submit an unclassified report on all the hacking attempts on election infrastructure last year. It will involve declassifying information that Reality Winner is facing prison time for liberating, which seems like a concession that such information has public value. But I’m particularly interested in the emphasis on the distribution of this report: both to the intelligence committees and to Congressional leadership, spelled out by job title. Mitch McConnell, Chuck Schumer, Paul Ryan, and Nancy Pelosi. That’s interesting because — as part of their investigation into last year’s hack — the Senate Intelligence Committee has already been briefed on this information. Indeed, the day after that testimony, Bloomberg reported — relying on three sources briefed on the investigation — that the hacks were much more severe than publicly known. So ultimately, if this bill becomes law, it will require an unclassified report on stuff SSCI has been getting briefing on to be submitted to both SSCI and Congressional leadership. The move comes in the wake of complaints from Democrats that Mitch McConnell refused to back a stronger statement about such attempted attacks in fall 2016. Now, I think some of the complaints about McConnell’s inaction last year are overblown, a demand that McConnell get ahead of where the Intelligence Community was willing to go publicly. And I think they largely obscure the more pressing question of what Trump advisors Devin Nunes and Richard Burr did. But I am cognizant of the fact that in a matter of months, we may get a better sense of the kinds of threats to our voting system that McConnell fought against publicizing. While protecting classified material, we have an obligation to inform the public about the recent cyberattacks that have cut to the heart of our free society. Democrats and Republicans must work together, and across the jurisdictional lines of Congress, to examine these recent thoroughly and devise comprehensive solutions to deter and defend against further cyberattacks. If you don’t look too closely, it appears to be a mature promise that the Senate will work in nonpartisan fashion to defend the nation. But let’s look closely, shall we? First, note who is on the statement: the rising Minority Leader, the Chair and Ranking Member of the Senate Armed Services Committee, and … some other guy. Lindsey Graham here is just filling in for the guy who should be on the statement if this were really bipartisan, Mitch McConnell. Furthermore, while it’s great the leaders of the SASC agree on this front, they only have partial jurisdiction over NSA, and none over FBI or CIA, the agencies having a public spat over this. Richard Burr, whose committee does have jurisdiction over the CIA and over counterintelligence (and who often avoids doing any oversight by invoking classification), is also conspicuously absent. In other words, it’s not so much a statement of bipartisanship, as an effort to pressure those who should be on the statement to join in. It’s also not a statement with enough GOP signers — three is the new magic number, absent Trump convincing Joe Manchin or Heidi Heitkamp to give up their seat for a cabinet post, in which case it will be four — to be able to sway votes in the Senate. The statement suggests Congress has been working hard to protect cybersecurity. They must be doing so in secret, because the main thing they’ve done recently is pass a law immunizing corporations for sharing information. Ah well. It’s a start. Schumer is very effective at making bold statements, and if that puts some heat on Mitch McConnell, so be it. Yesterday, Josh Earnest repeated a view — ascribed to the President — he had used the day before. 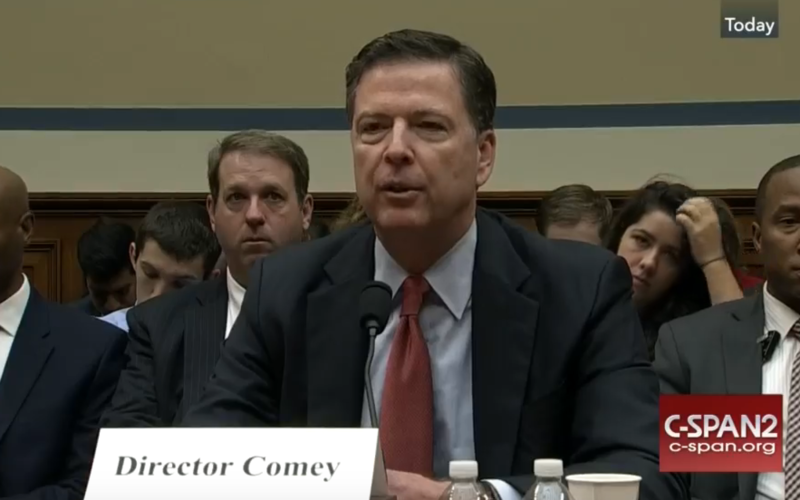 Q And does the President still stand by Director Comey? Would he advise Secretary Clinton, if she were to be President, that — or Donald Trump, if he were to succeed President Obama — that he could have confidence in that FBI Director? MR. EARNEST: Well, as I noted yesterday, the President believes that Director Comey is a man of integrity, that he’s a man of principle. There’s a reason that he serves — that he was nominated by President Obama to serve as the Director of the FBI. There’s also a reason that he was appointed to serve in a high-ranking position at the Department of Justice when President Bush was in office. There’s also a reason that a majority of Democrats and a majority of Republicans in the United States Senate both voted to confirm him to the position of the Director of the FBI. And the President, as I noted yesterday, continues to have confidence in his ability to do that job. Today, however, President Obama took a decidedly different stance, when asked directly by NowThis. That’s far more critical of Comey’s actions than Earnest’s statements of the last two days. An even more remarkable stance came from Chuck Schumer, who may soon be Majority Leader and who has been incredibly influential to Comey’s career, in an interview with Bloomberg. Senate Democratic leader-in-waiting Chuck Schumer said Wednesday he’s lost confidence in FBI Director James Comey over his handling of the most recent disclosure in the Hillary Clinton e-mail investigation — a tough rebuke to a man Schumer has long admired. “I do not have confidence in him any longer,” said the New York Democrat, who has criticized as “appalling” Comey’s decision to send a letter to lawmakers 11 days before the election disclosing the bureau’s new review of e-mails potentially pertinent to the investigation of Clinton’s private server. “To restore my faith, I am going to have to sit down and talk to him and get an explanation for why he did this,” Schumer said in an interview. Schumer not only made Comey’s career with support for each of his DOJ appointments, but of course set up the 2007 testimony that made Comey’s run up some hospital steps so famous. Mind you, Schumer seems to leave open the possibility he might change his mind, if Comey explains “why he did this.” So it may just be an effort to start putting as much weight on the scale as the GOP long has. Still, Schumer’s comments are the first inkling that Comey may not survive this. Virtually the entire political class has now united to defeat Donald Trump, with Morning Joe today staging a Michael Hayden appearance that served largely to allow Scarborough to tell the story of Trump asking three times in a foreign policy briefing why the US couldn’t use its nukes. As Dan Drezner pointed out on Twitter, Scarborough says the event happened months ago — when the primary was still going on — but has just now staged its telling. Beating Donald Trump is important. He’s a racist who aims to win by promising white working class people they can resume persecuting people of color again, and he is dangerously inconsistent. That said, he does want to spend lots on infrastructure and protect workers from the ravages of globalization, something often forgotten in depictions of him as entirely policy free. But the transpartisan obsession with beating Trump has largely applauded two developments that, for liberals, for democrats, for those who believe in peace, for progressives, should be a worry. First, the Neocon establishment has come out in enthusiastic support for Clinton, with ideologue Eliot Cohen orchestrating serial efforts (one that even includes John Yoo!!) to oppose Trump. They point to Trump’s erratic nature and more recently the theories of Putin’s influence. They do so even in the face of a report that Paul Manafort, through whom any Putin influence would be managed, is checking out. I exchanged messages Tuesday evening with a longtime ally of Trump campaign manager Paul Manafort, whom I asked about who was calling the shots in the campaign. The response indicated that Manafort, a veteran of Republican politics brought in this spring for the transition from primaries to the general election, has lost control over his candidate. I’m getting whiplash following the Manchurian Trump stories. Maybe the ones suggesting Bill Clinton was behind the Trump run are the true ones after all. And even while the focus has been on Russia’s alleged influence with Trump, there has been no focus on Hillary’s unquestioning support of Saudi Arabia (the country that had ties to 9/11) and Israel. Or on Hillary’s equally troubling policy proposals, such as starting a No Fly Zone over Russian planes. As Will Bunch noted in a great column, Democrats have become the party that shuns people who chant No More War. The delegates didn’t hear from an Andrew Bacevich or the equivalent of James Madison, but they did get Panetta, who — as noted in this excellent analysis — has supported expanded war powers for the White House, failed to push for real accountability on Bush-era torture, and once suggested that “a 30-year war” will be needed against terrorism. Was it really rude for some of the DNC delegates to chant “no more war!” during Panetta’s speech? Or were some citizens desperately trying to be heard with a different point of view, in a nation so eager to squelch any public debate? It should be a scandal that the United States drops bombs from flying death robots or our obscenely expensive military jets over countries like Libya, swaths of Africa, or Syria based only on a 15-year-old congressional resolution passed after an attack carried out mostly by Saudi Arabians loyal to a terrorist group that barely exists in 2016. But we’re afraid of any frank discussion of that, or the recent admission by the Obama administration that U.S. military actions in nations with which we’re not technically at war have killed 116 innocent civilians. That’s a number that experts find ridiculously low, by the way, and doesn’t as include as many as 85 Syrian civilians who were killed in late July by a U.S. airstrike — a story that was all but ignored in the media. Even if you strongly believe that such collateral damage is necessary to defeat international terrorism, chanting “USA! USA!” to support militarism is both jingoistic and crudely callous toward the dead. Not only has Hillary gotten the support of the people who brought us into Iraq based on a lie (she told her own little stretchers to get us into Libya), but we’re now drowning out any voice for peace. Then there’s the parade of heinous billionaires Hillary has rolled out, with Mark Cuban, Mike Bloomberg, and now Meg Whitman. NYT’s coverage of Whitman’s announcement emphasizes that Hillary has been courting Republican billionaires since before she finalized the nomination and that Hillary’s pick of the pro-TPP pro-Wall Street Tim Kaine is what sealed the deal for Whitman. Whitman, who said she would remain a Republican, brings with her a considerable network of contributors, some of whom she said were open to giving to Mrs. Clinton. She said she was willing to campaign for Mrs. Clinton, said she would do her best to gather checks for her campaign and indicated she would personally give to both Mrs. Clinton and her affiliated “super PACs.” An aide to Ms. Whitman said she would personally give at least an amount in the “mid-six figures” to the Clinton effort. While Democrats openly appealed at their convention last week to Republicans uneasy with Mr. Trump, Mrs. Clinton and her top supporters have been making a similar cross-party pitch in private since before the Democratic nomination fight even came to its conclusion. She said she had told Mrs. Clinton that she wanted to see the two parties’ conventions and assess the running mates that each nominee chose before making her decision. When Mrs. Clinton selected Senator Tim Kaine of Virginia, a consensus-oriented figure, “that was a positive for me,” Ms. Whitman said. Whitman’s nod to Kaine is of particular concern to me, as Democrats downplayed his anti-choice and pro-business policies, at least in public, until after the convention. Now, if anything happens to Hillary (who has some dangerously unhinged enemies), we’ll basically have a moderate Republican running the country. It’s not just that Hillary has secretly been courting oligarchs since before she cemented the nomination. It’s that her post-convention politicking has focused on it, as if the approval of oligarchs is what it will take to win in midwest swing states. The guy who will likely become Majority Leader is even more aggressively pursuing typical Republican voters (though this view — admittedly filtered through the potentially inaccurate National Review — has some huge logical contradictions, not to mention an odd idea of what it would take for Democrats to continue to win Illinois). Schumer’s optimism is driven more by national demographics than by the specific traits of his candidates. He contends that Millennials, or voters aged 18 to 35, will be the largest age group voting in this year’s electorate, even if they don’t turn out in massive numbers. Democrats, it appears, want to become the party of the Republican soccer mom, which may work well with the bellicose warmongering, but which seems to view economic malaise as an opportunity rather than a problem. So yeah, by all means, let’s beat the orange crazy man. But let’s also be cognizant of the more politically palatable craziness that gets embraced in the process. https://www.emptywheel.net/wp-content/uploads/2016/07/Logo-Web.png 0 0 emptywheel https://www.emptywheel.net/wp-content/uploads/2016/07/Logo-Web.png emptywheel2016-08-03 09:13:482016-08-03 09:13:48What Price Victory? Motherboard has an interesting new detail on the Silk Road investigation from a mostly refused FOIA. June 1, 2011: Gawker publishes this story describing Silk Road. June 6, 2011: NY Organized Crime Drug Enforcement Strike Force gets tasked with investigating Silk Road. 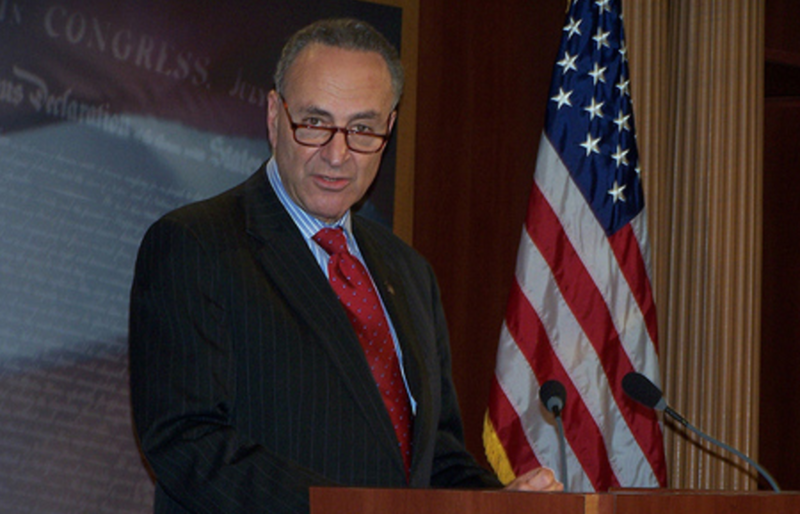 I find the Gawker to Schumer to New York law enforcement to feds very interesting given yesterday’s events. https://www.emptywheel.net/wp-content/uploads/2016/07/Logo-Web.png 0 0 emptywheel https://www.emptywheel.net/wp-content/uploads/2016/07/Logo-Web.png emptywheel2015-08-26 13:02:012015-08-26 13:10:16Chuck Schumer Got Results! The WaPo has a good review of how postal service worker Doug Hughes managed to fly his gyrocopter onto the Capitol lawn without being spotted by the Secret Service or other security forces. But the best part of the story cites corporate sucklings Chuck Schumer and Ron Johnson expressing dismay that the security theater draping DC didn’t prevent Hughes from landing a harmless aircraft on their lawn. On Capitol Hill, there was less concern Thursday about Hughes’s message than how he delivered it — flying into the heart of the nation’s capital and alighting on the Capitol lawn about 1:30 p.m. in what amounts to an airborne go-cart, powered by something like a lawn mower engine, and kept aloft by an overhead rotor and a small propeller. As Nancy Pelosi noted in comments yesterday (which were almost, but not quite, this shrill), there are reasons to want the Capitol to remain fairly open. And it is fairly open — easier to get into than an airport, for example. That makes it accessible to the thousands of local lobbying and school groups who want to see their Representatives’ office. But it also makes it permeable by lobbyists. The big money lobbyists, of course, do far more damage to this country than a gyrocopter ever could, damage that Schumer and Johnson are enthusiastic participants in. Which is sort of Hughes’ point. I expect more ironic symbolism from this event going forward, as a bunch of security-industry intoxicated Congressmen take as a lesson from this that they need to insulate themselves even more from the people warning about them insulating themselves form their constituents.